Dame Yve Buckland, the founding chair of the Consumer Council for Water (CCWater) is chipper, taking her imminent departure from the organisation in her stride. She is standing down after a decade in position, a decade that began in turmoil and is ending on the cusp of major reforms. Today, she meets Utility Week to reflect on her time in the role. In ten years, there has been an almost complete turnaround of how customers view their water companies. In 2005, bills soared following the PR04 review, and the industry was splashed across the news, with Panorama investigating as droughts hit and leakage targets were missed. Today, the industry has just emerged blinking from one of its toughest price reviews, with customer bills falling in real terms, complaints down by more than 50 per cent and customers now an integral part of the price review process. That’s success in anyone’s terms: how did Buckland do it, and what’s next for the organisation and her successor, Alan Lovell? Buckland’s departure comes at a time when the future of consumer watchdogs is up in the air. The energy equivalent, Consumer Futures, was rolled into Citizens Advice last year. At that time, there were questions asked about whether CCWater should go the same way. Buckland’s answer is clear and definitive: CCWater is here to stay. She says the loss of the “strong consumer voice” of Energy Watch (which became Consumer Futures before becoming part of Citizens Advice) has dramatically hit the public perception of energy and this needs to be avoided in the water sector. That independent voice will help avoid the mistakes of the past – mistakes that Buckland recalls with a wry smile today. “There is no doubt that in those early days customers were not receiving the service they wanted and deserved – nor were they getting value for money,” she says. In April 2005, customers saw their bills jump by a massive 8.5 per cent, thanks to a light hand from the regulator in PR04. There was an increase in customer bills of 18 per cent over the five years to 2010. The squeeze on household budgets was exacerbated by a lack of payment assistance schemes “as well as a lack of customer awareness that help was available”. Added to this already toxic mix was a drought in 2006, missed leakage targets, hosepipe bans, cases of misreporting and whistle blowing at Severn Trent and Southern Water, which were placed under criminal investigation for fraud. This progress has been made by working with the companies, rather than, as Buckland puts it “shouting at them from outside”. She says CCWater was never about gaining cheap headlines – pointedly adding “unlike some other consumer groups”. The next chapter for CCWater could be having to deal with growing political interference in the sector. Labour has promised to introduce a national social tariff, plus more new regulation. As for social policies and tariffs, 14 of the 18 companies now offer them, an increase from six before the latest price review. But the way that levies on bills effectively subsidise those unable to pay is not something that sits too comfortably with the majority of customers. Or Buckland. She prefers a tax and benefits system to help those in need. “Customers don’t like cross-subsidies, or that companies are managing the cross-subsidies.” A prime example of this is the £50 giveback for customers of South West Water. Buckland says this “opens the door” to further tax and benefit solutions being introduced across the sector. Failing to help them pay their bills could prompt a legitimacy crisis – like that seen in 2006 in water, and currently being experienced in energy. The bruising experience for the water companies during the PR14 process has been seen as a victory for consumers, with bills falling in real terms over the next five years. Buckland adds the role and involvement of the customer challenge groups (CCGs) proved vital in achieving this result. “In the last price review in 2009, we launched and got going the quadripartite between the key stakeholders, the statutory stakeholders the regulators and ourselves. That has been built on in this price review with customer lobby groups and other stakeholders adding to it. Utility Week asks whether seeing those plans become reality is the big challenge facing her successor, Alan Lovell. Buckland says he has to make sure that it goes beyond just ensuring the plans get delivered. The incentive mechanisms Ofwat introduced in PR14 mean that, alongside the risk of financial punishment for underperformance, the water companies also have the opportunity to gain for overperformance. It is a good incentive and one that consumers, due to the role of the CCGs, have signed up to and support. But while that is the case now, Buckland warns that it may not always be so. “Consumers have short memories,” she says, passing on a warning to Lovell. “It could be problematic to try and explain that to customers in four years’ time if they feel their bills are high and if they are then being told they have to pay more for customer outperformance. Buckland also says Lovell will have to ensure the next price review represents a good deal for customers in terms of costs and service while ensuring that the companies can afford to deliver what they are promising. The key task for the new man will be to safeguard all the good work of the past decade and not to undo that dramatic slashing of complaints – down to 123,218 in 2013/14. This is particularly important as the sector steels itself for more scrutiny when the market opens in 2017. This impending change to the market represents a “natural break” for Buckland, and the ideal opportunity to step down. As for her next move, she laughs at the suggestion of trying to repeat the success CCWater has had in the water sector in the energy sector. “That’s quite a big challenge! At the moment I just want to pause. When Buckland gets that opportunity to pause – however long it proves to be – what will be her standout memories be from her eventful time in office? “My happiest memory was when we had the Gray report [into Ofwat and consumer representation in 2011]. He reviewed Ofwat and ourselves and I don’t think he really ‘bought’ customer bodies. “It was great when he came out of that review saying we do a good job and he wouldn’t want to change it. That was a personal high. I remember running around the office hysterically happy that day. The day-to-day representation of customers is something Buckland obviously enjoys. Talking about boring people at dinner parties and giving cabbies advice on how to complain makes her smile to herself. 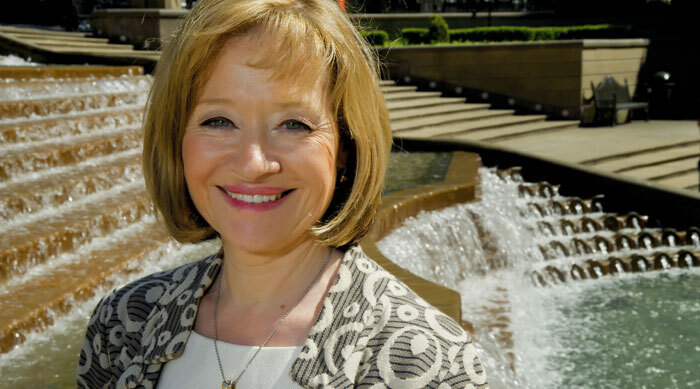 Even though she will no longer represent water customers, Buckland intends to remain “a spectator from the sidelines” and an advocate for the UK water sector. “I very much encourage people to get the value out of what they are paying for their water by drinking tap water – which is so cheap and of such good quality. “If I’m ever seen drinking bottled water, I hope you put me on the front page of Utility Week in a cartoon.” We’ll be watching.